Used by both street and track E30 enthusiast when running coilovers. Excellent quality thoughout and very thin so your E30 can go as low as you desire in the front. Like any solid mount, will trade off some ride comfort and noise isolation for feedback over rubber mounts, though this is generally found to be very tolerable by customers. Ground Control can be seen on many street and track cars at any given event, Why? because there products are simple, quality pieces made to get results and last under real world conditions. The choice of countless enthusiasts, they stay in favor due to there excellent designs and honest quality commitment. Only high grade US manufacture components, like Aurora bearings, go into all GC products. 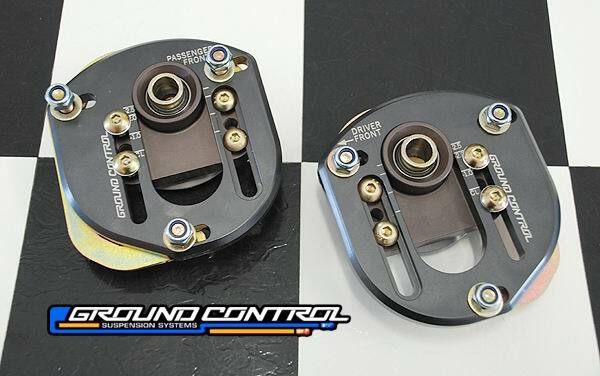 As mentioned, camber and caster are separately adjustable by sliding the mounts, without removing any components from the car. The priority of this design is to allow fast, repeatable alignment changes at the track.